The second generation of our hugely popular light wind freeride kite, the Juice is ideal for those days on the beach when the wind doesn’t arrive. The kite is available in two sizes, 15m and 18m and is designed around a 3-strut platform to ensure it retains a playful nature in the air, despite the large size! The Juice has amazing upwind performance, even in hardly any wind. 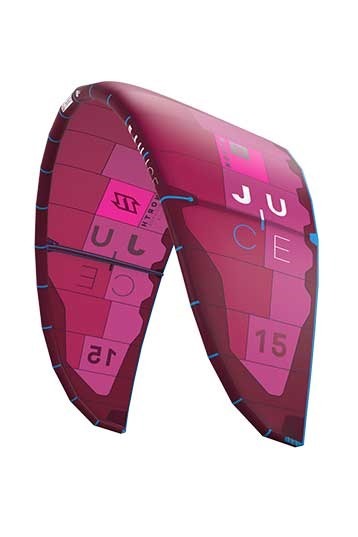 Unlike some large kites, which have a racing focus in mind, the Juice was designed for freeriding. During the design process the Juice was tested using Twintips, this enabled us to ensure the kite offers the optimum performance for light wind freeride action. You’ll be amazed with the huge jumps on the Juice too, the kite glides and offers plenty of hangtime and it is a great kite for airstyle tricks. I thought all day what's the problem with the new Juice? I think none. I was the problem, I had just too much expectations. Tested this winter so many kites, small and big in all kinds of shapes, the Juice just didn't give me anything new. Not the best low end, not explosive enough to be a challenger and in its high-end, I would step to a Rebel 12 for a more lighter, explosive and playful kite feel. So I think the Juice is great for riders who like to cruise early & jump easy. Bring a big board and you will plain from a steady 9 knots. Pull on the bar in 15 knots and you will fly and float. Not real high, but always in control!